As a small business in the cutting tool industry, we are committed to making a big difference for our customers. Our customer is number one. J & C Grinding is a “Woman Owned” manufacturing facility. Your success is our future. Our goal is to provide 100% customer satisfaction in a timely manner with competitive pricing. We guarantee your satisfaction. If you’re not 100% satisfied, please tell us. If we’ve exceeded your expectations, please tell a friend. Contact us today for a custom quote on all your design and regrinding needs. At J & C Grinding, LLC, we help customers succeed by providing them with superior service and quick turn-around times. That unique combination of quality and speed enables us to continually exceed customers’ expectations. We treat customers, employees and vendors as we would like to be treated – with honesty, courtesy and respect. We practice our belief in The Golden Rule by offering fair pricing and quick turnaround, and by continually training the members of our team to perform their responsibilities efficiently and safely on the most modern equipment. We’ve been in business since 2004, when John & Carol Zeh founded the company, and we look forward to being around for many more years. J & C Grinding, LLC is a Family owned and operated Business based in Ohio with over 30 years experience in Tool and Cutter Grinding Experience. Our full service grinding shop can build your prototype or handle your production runs with confidence and ease. We are experienced and reliable and take pride in our work by providing precise and accurate results. We provide Custom Tool Design and High quality tools in a timely manner. We also provide full re-grind service and modifications on most Carbide and HSS cutting tools. We always try to accommodate the occasional “RUSH” orders with attention to detail as we do on every job. EMERGENCY SERVICE is available if you need 1-2 day turn-around. We put our customers first, and no job is too small. Whether you need a couple items or 10,000 items, let J & C Grinding be your grinding department. 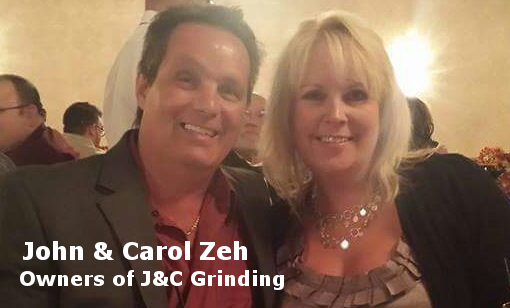 Co-Owner Carol Zeh – has over 25 years of customer service and sales experience with a knowledge/background of cutting tools. She is eager to assist you in your needs. At J & C Grinding our motto is Creating Quality Solutions, which represents our focus on quality and delivery.